US equity indexes continue to broadly climb, with net weekly gains ranging from 3.2% (Nasdaq comp'), 1.7% (sp'500), to 1.2% (NYSE comp'). 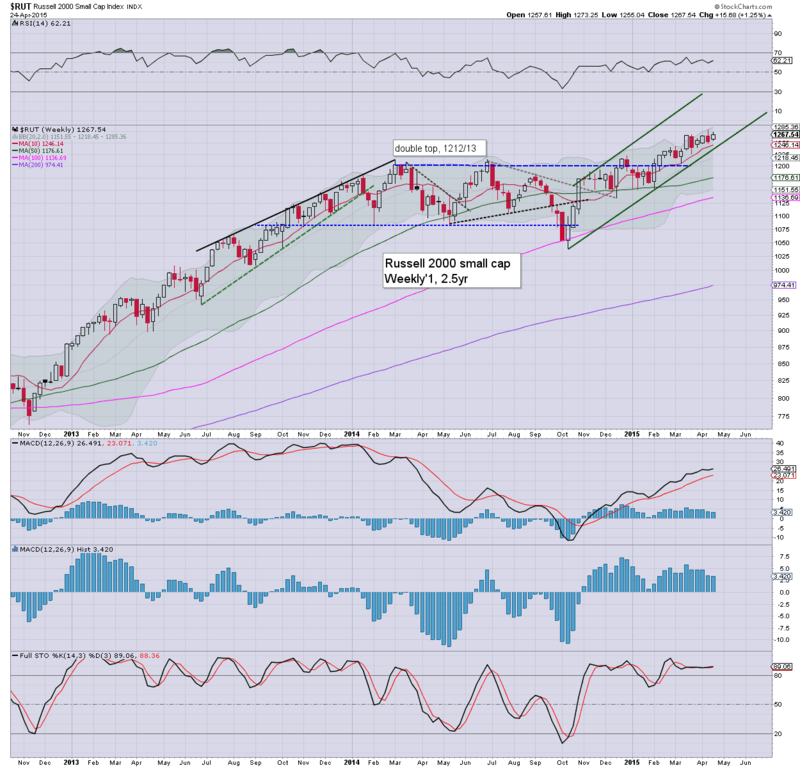 Near term outlook is bullish to the sp'2130/40s by mid May. 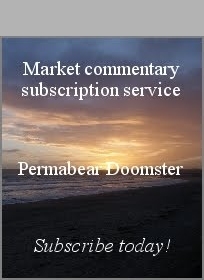 The weaker USD bodes for underlying upward pressure for equities into the early summer. A significant net weekly gain of 1.7%, with a new historic high of 2120. The upper bollinger will be offering the 2140s in early May. Underlying MACD (blue bar histogram) cycle remains negative, but did tick higher, and is set to turn positive at the Monday open. In theory... there is another 4-6 weeks of 'fair upside'.. which will take the main market into mid June. First support is the recent low of sp'2039, but far more natural... the giant 2k threshold.. where the lower weekly bollinger is lurking. Under no outlook does it look viable for the market to be sustainably trading under 2K for some months. 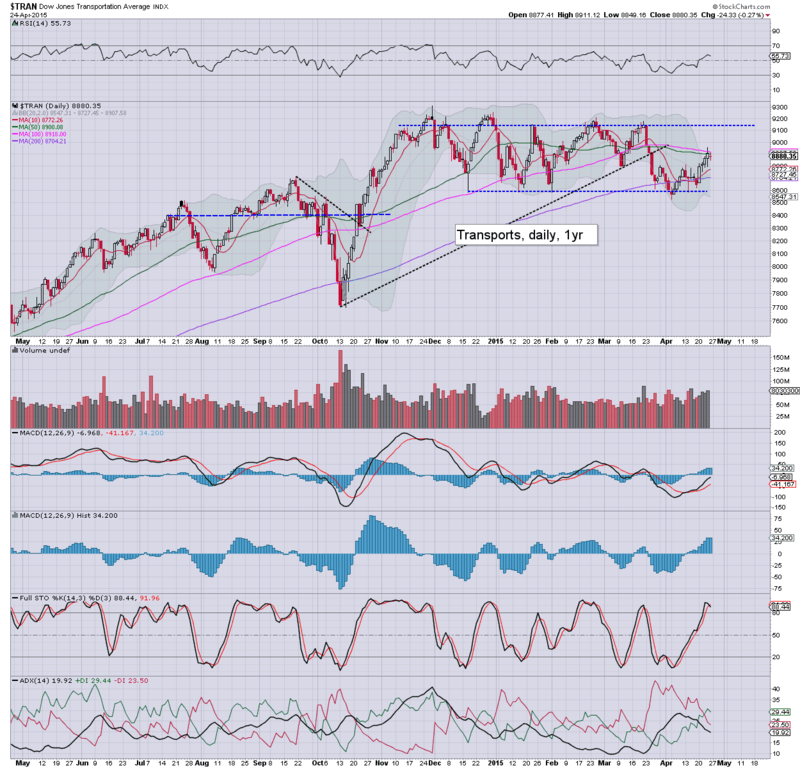 A very sig' net weekly gain of 3.2% for the tech.. with a post 2009 high of 5100. The Nasdaq is now just 32pts shy of the March 2000 high. 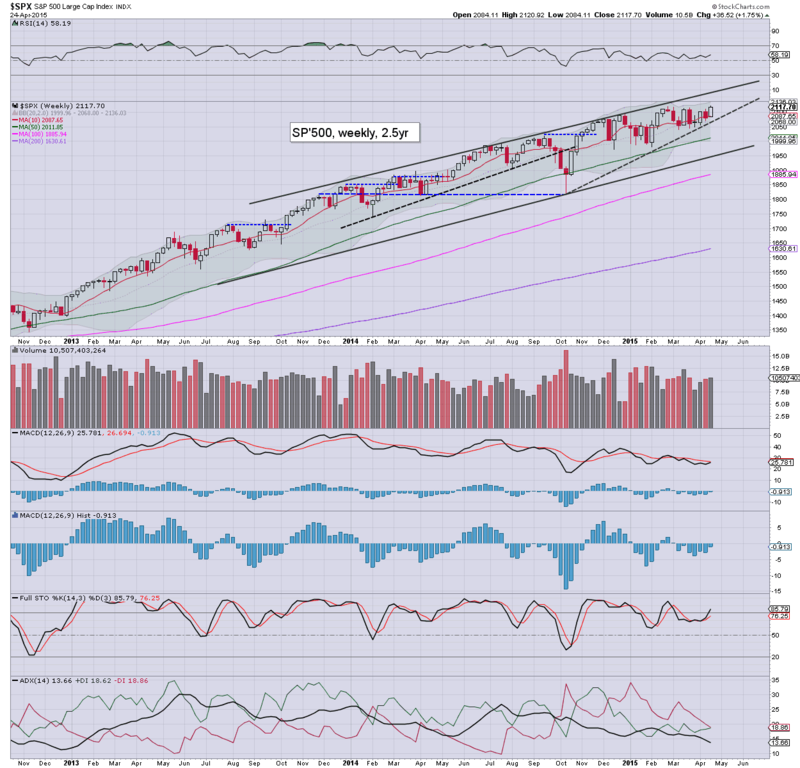 A weekly/monthly close in the 5200s - which now looks likely, will be extremely bullish for the broader equity market. Key support is around 4600... which is now some 8% lower! Best guess... Nasdaq to break and hold the 5200s... and proceed to at least 5500/700 this summer.. although a more natural target would be the next psy' level of 6K. The mighty Dow gained 253pts (1.4%), with a somewhat important close above the psy' level of 18K. 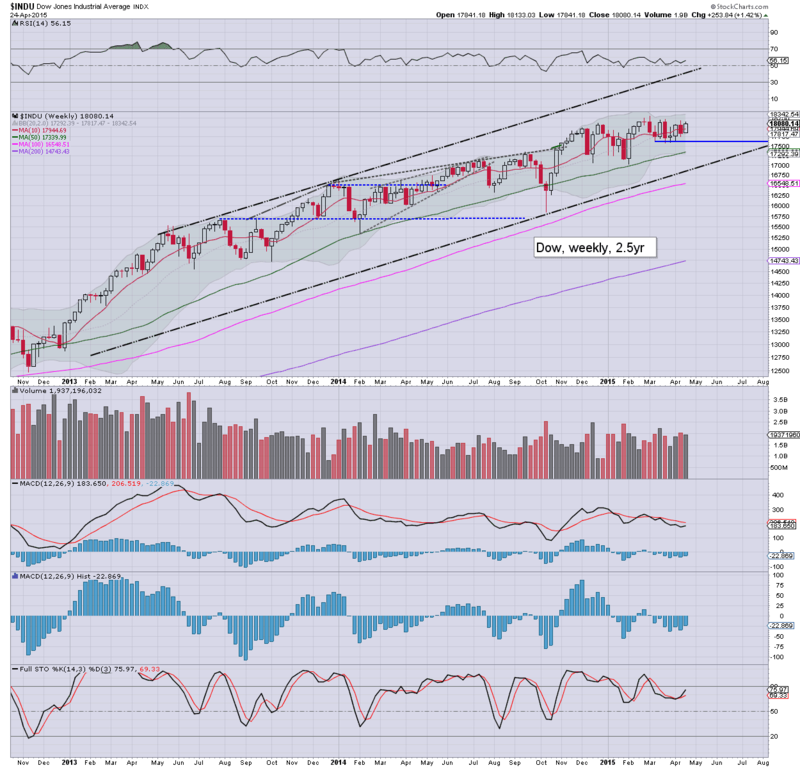 Both the weekly/monthly cycles are offering viable upside into the 18400/600 zone this May/June. First key support remains the 17K threshold, and that sure looks out of range in the near term. The master index climbed 1.2%, with a new historic high of 11221. There looks to be viable upside to the 11300s in early May. 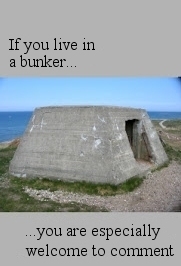 Certainly, 12K will be difficult to reach. A weekly close in the 11400s would give some clarity that the market is set to grind higher into June.. if not much of the summer. The second market leader clawed upward by 1.25%, and just fell short of breaking another new high. The 1290/1300s look viable in early May. Underlying MACD cycle remains strongly positive. Rising support is now around 1250.. so the bulls have 2% of downside buffer in the immediate term. Despite seeing a net Friday decline of -0.3%, the 'old leader' gained a very respectable 2.7% this week. 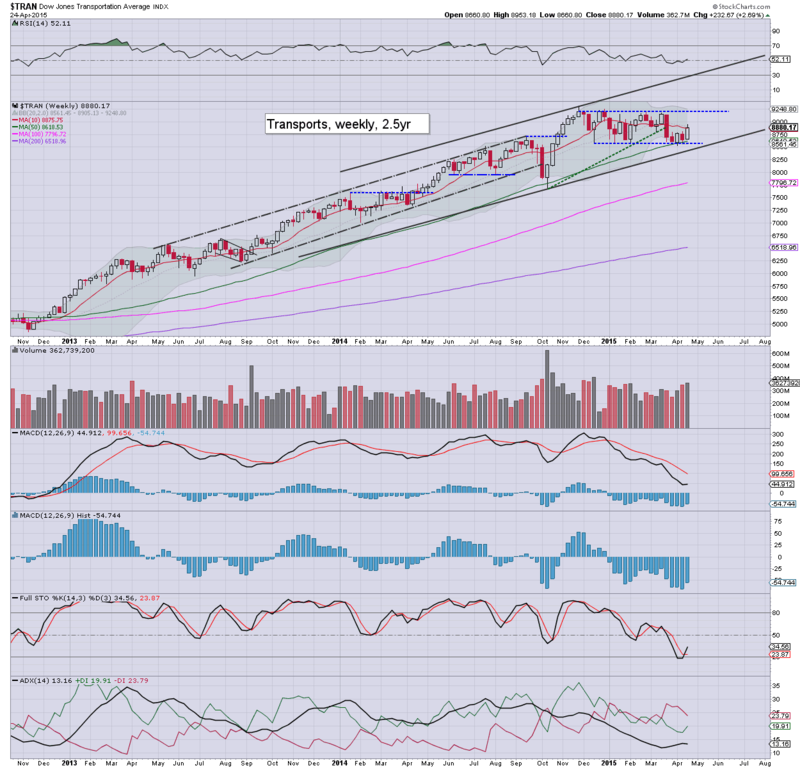 The transports remain stuck within a very tight trading range of 8500/9200s. 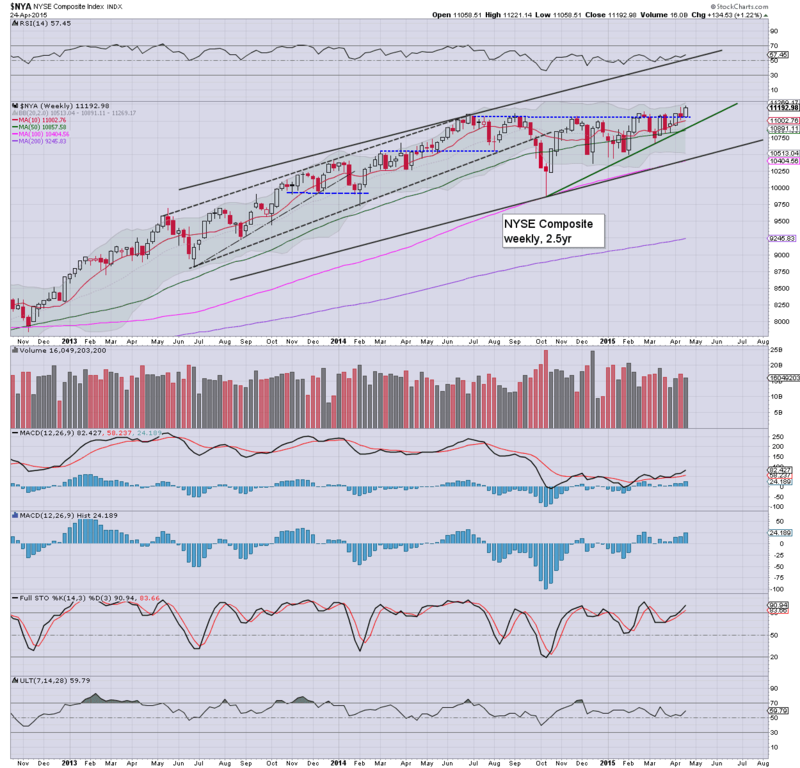 A weekly close in the 9300s will offer clarity that 10K will be hit this summer. However, with a weakening USD, that will help Oil break into the $60s, and that will put particular downward pressure on the Transports. A week for the equity bulls, with notable new historic highs in the sp'500 and NYSE comp'. 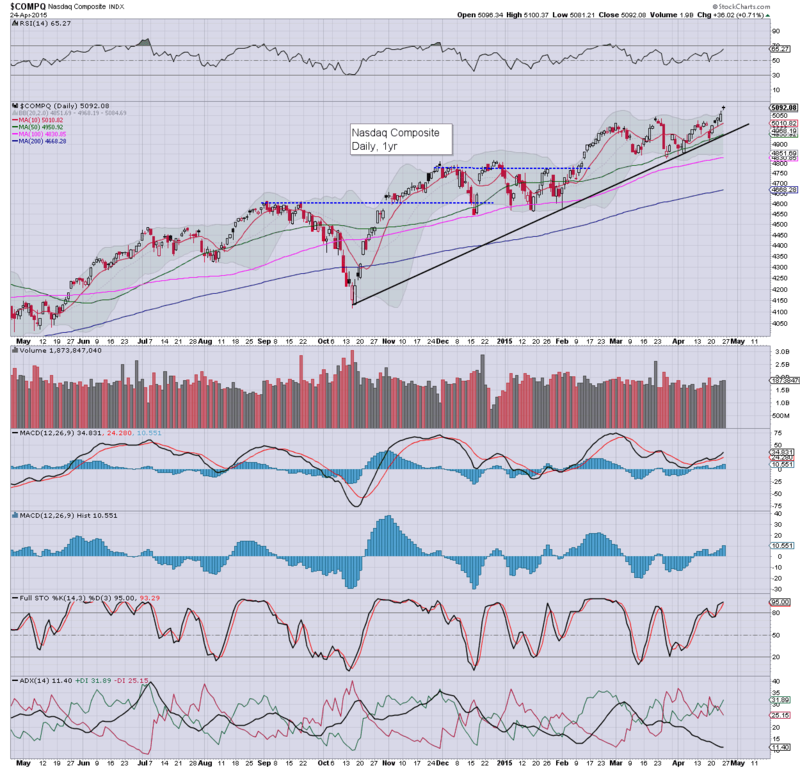 All US indexes remain within broader up trends. Most notable.. the Nasdaq - the only index yet to break a new historic high since the collapse of 2008/09, looks set to lead the market higher into the summer. There is simply nothing for the equity bears to look forward to. W - GDP Q1, Pending home sales, EIA report. *FOMC announcement 2pm. Market is not expecting any change in rates.. a minority believe June is still possible (myself included), but most 'not until at least Sept'. There will not be a Yellen press. conf. 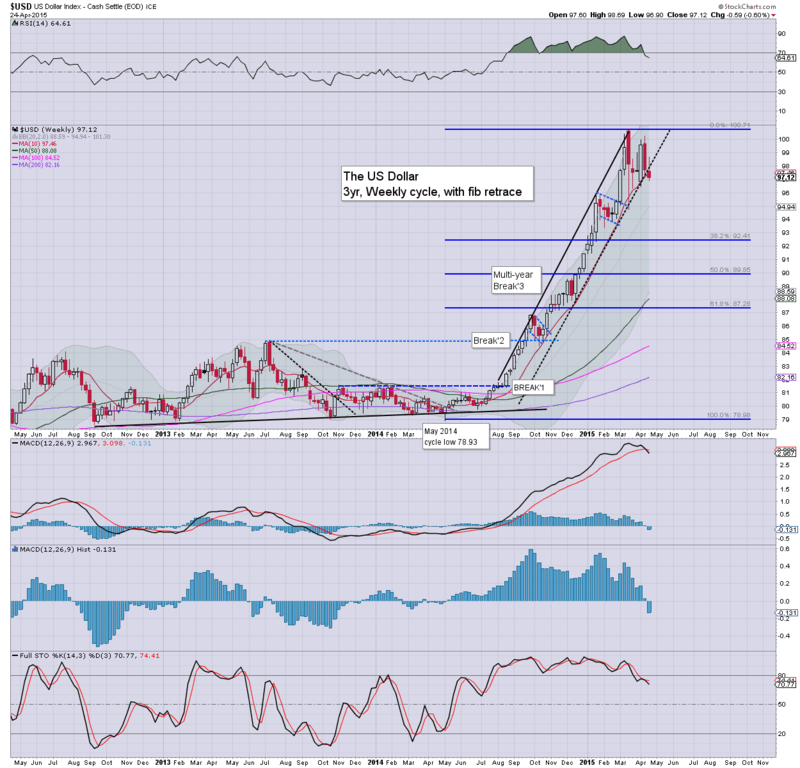 As I've regularly noted lately, the USD appears to be seeing a retrace.. which will likely take until at least June. A weaker USD will help pressure equities and most dollar denominated asset classes higher. In particular, Oil looks set to break into the $60s, and proceed into the $67/75 zone. How high might equities be driven? Certainly, the sp'2130/40s look pretty easy. However, it is notable that by late May/early June, the giant monthly cycle will be offering the 2200s. 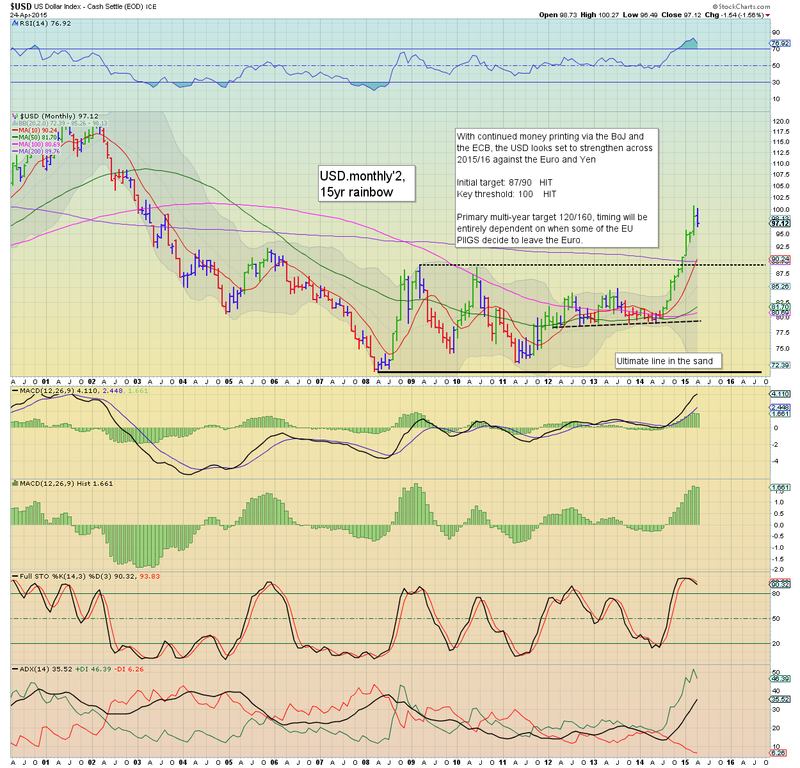 *I remain long Oil - via USO, and look to be broadly long into the $67/75 zone by June/July. I'll also consider picking up TWTR (again) ahead of Tuesday earnings. The USD settled net lower for the second consecutive week, -0.6% @ DXY 97.12 (intra low 96.90). The USD appears to have maxed out at 100.71, and now in the process of a sig' retrace... at least to the 93/92s. A weaker USD has important implications for all aspects of the US capital markets. *without going over everything I noted in yesterdays closing post, I wanted to just highlight the end week situation. 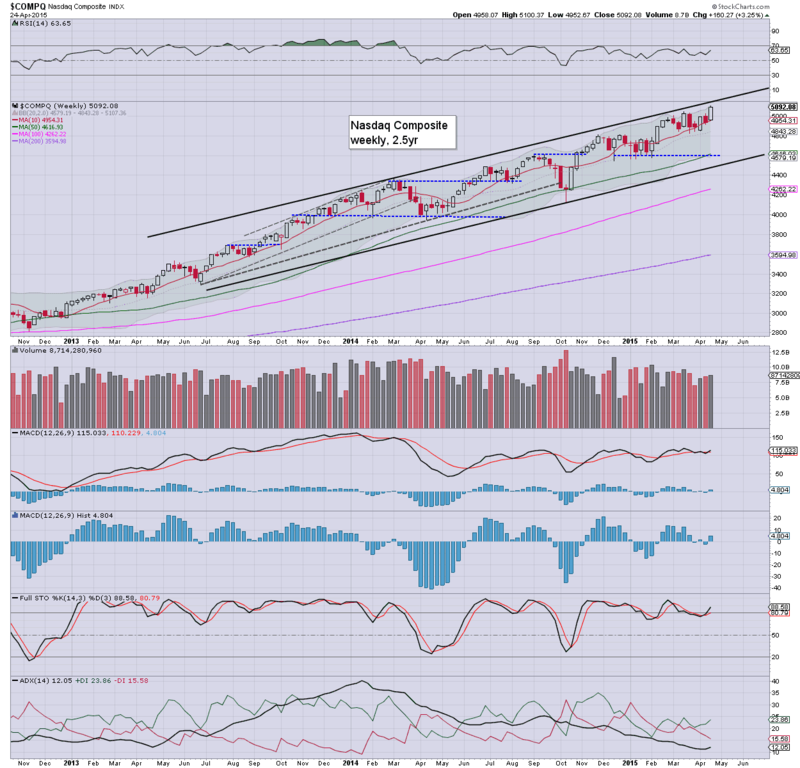 So.. a net weekly decline, and an arguable break of rising trend/channel. USD is on its way lower.... which will help prop up equities.. and especially WTIC Oil. The monthly 'rainbow' candle is now blue.. offering a hint of what is likely a retrace into the summer. US equity indexes closed a little higher, sp +4pts @ 2117. The two leaders - Trans/R2K, both settled lower by -0.3%. Near term outlook remains bullish into May, as earnings have helped reassure the market that things will keep ticking along into the early summer. 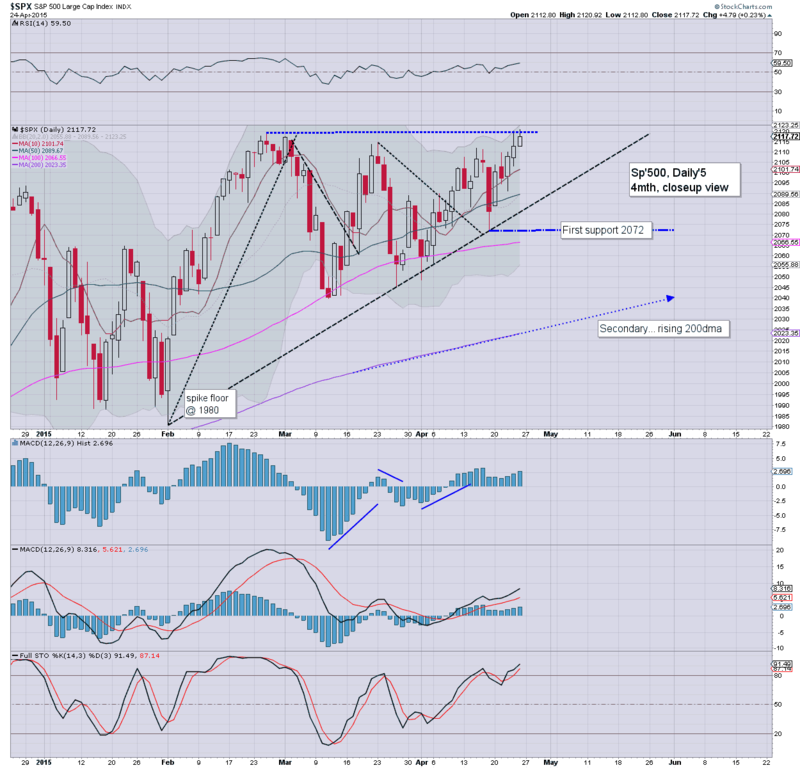 *Trans remains relatively weak, and equity bulls should be seeking a weekly close in the 9300s in May/June. Little to add... a net daily gain.. making for a rather sig' net weekly gain. There is little reason why the market won't continue to claw higher across next week.. and into early May.